I always read the dedications of books. I always wonder about what that person meant to the author. Some are transparent. “To my father…..” “To my son….” Others less so. My favorite dedication of all time is from 1931, “The Archie and Mehitabel Poems” by Don Marquis. (Archie is a cockroach who sneaks into the newsroom at night and uses the typewriter to write free verse.) Marquis dedicated his book “To Babs. For Babs knows what. And Babs knows why.” You can never top that one. My many books have been dedicated to a few close friends, and to supportive agents, but mostly to my sons, my sister and my mother. THE GREAT PRETENDERS has a unique dedication. 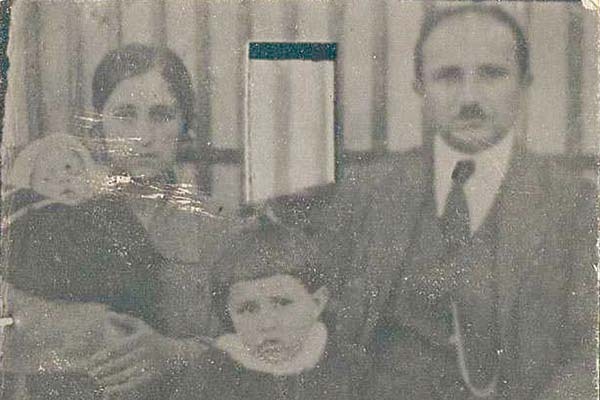 Pakradouhi (pronounced Pahk-rahd-o-oui) is the Armenian name given to my mother when she was born in Constantinople in March 1922 . It is the feminine of Pakrad, an Armenian prince c. 1100. Her parents were originally from southeastern Turkey, forced to flee to Syria where they had lived for four months before coming to Constantinople. Pakradouhi was born shortly after they arrived. Constantinople was but a stop off; the family had plans to emigrate to the US, to Los Angeles where my grandmother had relatives, a brother and sister who had emigrated about fifteen years earlier. The Boyds, thoroughly Americanized, could say Angagh’s name, but not Pakradouhi. Too much of a mouthful. 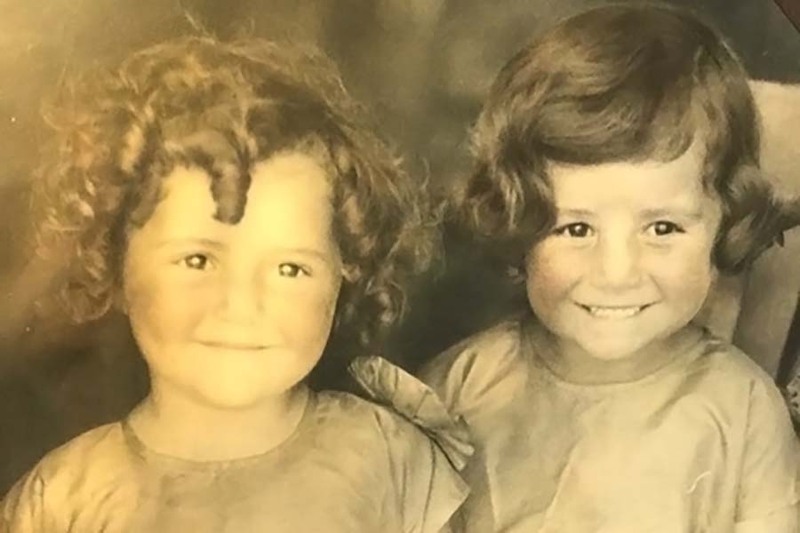 At first her cousins called Pakradouhi “Peach Face,” but eventually that evolved into Peggy, a chirpy popular name for girls in the 1920’s. And Peggy she stayed. She started kindergarten and graduated from high school as Peggy Kalpakian. When at age 21 she got her own naturalization papers, she was told if she wanted to change her name, now was the time to do it. She did it, became Peggy Kalpakian. A year later she married Bill Johnson and became Peggy Johnson. Later, her grandsons gifted her with the name, Maudie. Pakradouhi vanished into the distant, unremembered past. In 2017 when my son Brendan and his wife Shweta knew they were expecting a girl, they told my mother they were giving their daughter Pakradouhi, as a middle name in her honor. My mother wept with disbelief, with joy, to have her original name reunited with the family for the first time in 95 years. 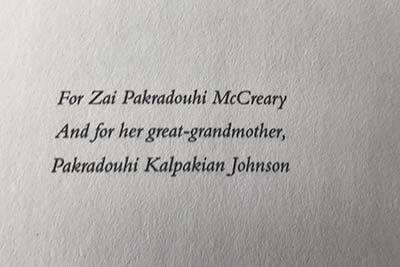 No doubt Zai Pakradouhi McCreary (born January 2018) will roll her eyes, perhaps even resent it when she will be obliged to pronounce the name, and answer the incessant question, “How did you come by such a weird name?” She will tell the story of how it was taken from her great-grandmother, not by nefarious means, but the simple, slow, relentless erosion of Americanization. And every time Zai tells the story, she will, of necessity remember her great-grandmother. My mother’s original name will be restored, not simply to her, but to posterity. This makes my mother happy. Makes all of us happy. One day it will make Zai happy. So with this dedication to THE GREAT PRETENDERS I thought to connect the oldest and the youngest of my family. My mother turned 97 this week. And Zai Pakradouhi McCreary, the toddler, is just about the same age her great-grandmother was when her family braved the Atlantic and the Mediterranean–twice–to find a new life in America. What a great story with a surprise ending. Kept me reading to the last word. 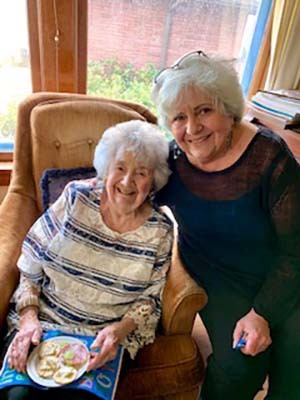 This is a truly remarkable dedication to a truly remarkable lady！My dear Aunt Pakradouhi Peggy Kalpakian Johnson is a treasure for the entire family and a tie to our past. She is a source of strength and knowledge that continue to amaze us! There is an African saying that I learned in school that says « Un vieillard qui meurt c’est comme une bibliothèque qui meurt » which reminds us that an older person is like a library, rich with information. In this case Aunt Peggy is also full of love. Simply. Simply beautiful! A tribute that shines beyond compare. Thank you Laura for allowing me, in part, to bear witness to your beautiful family. The photo images are priceless. I look forward to your book. I LOVED that story, made all the more poignant for me having known your family and having a family with similar immigrant roots and hardships. Every American should know these stories about the unbelievable trials people were willing to endure to achieve the American dream. Those dreams are just as real today for the millions suffering persecution and even extinction in their home countries. It does not make them criminals to yearn for a better life. My grandmother Elisa, you may remember, raised three young daughters alone after her tailor husband Giuseppi, employed in a sweat shop, died of pneumonia within a year of getting off the boat. She never remarried and that clan now numbers 117 at the last reunion. Thanks so much for sharing! Much love to your family and belated birthday greetings to Maudie from Billy. Fascinating family history, and what a wonderful dedication. I didn’t even know Brendan and his wife had a daughter. Great. Hope the book does really well. Must pre-order it if I’m able to do so from Amazon UK. What a beautiful pic with your mom. So lovely. Beautiful living story. I look forward to reading Pakradouhi’s memoir. This is one of the most memorable dedication I have ever read, composed with the sensitivity and verbal skill that seen to be your trademark. I hope that you will continually add to it until it blossoms into an inter-generational memoir and the epitome of the genre. I always read the dedications in books and this is the best story behind the dedication in your book. Reading your blogs is always a joy, but this, of course, really touched my heart. So glad you and Maudie are in my life. I found this story fascinating . You are so furtunate to have your mother by your side to share your family history. 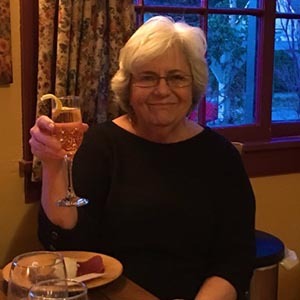 I first met Peggy Johnson in the early 1980’s in the Friday morning walking group. We walked together at different times, there were so many interesting women in this group that I loved to walk with someone different to walk and talk, Of course, Peggy would talk about Laura, her daughter, the author; and I read AMERICAN COOKERY some time in the 80’s along with a short story from a magazine about a young woman who invited a man to dinner and some kind of pot or fry pan played a big part in this story. I simply knew Peggy as an American, so this is all new to me. Now I want to go back and walk very slowly with Peggy while she tells me of these earlier years of her life. Even better we both sit while she tells me some of her early memories. I promise I will practice saying her birth name.